I learn a lot from comment threads on the internet. 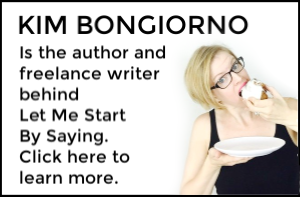 Helpful things, like recipes, books my kids might like to read, how I shouldn’t be a mother. Stuff like that. 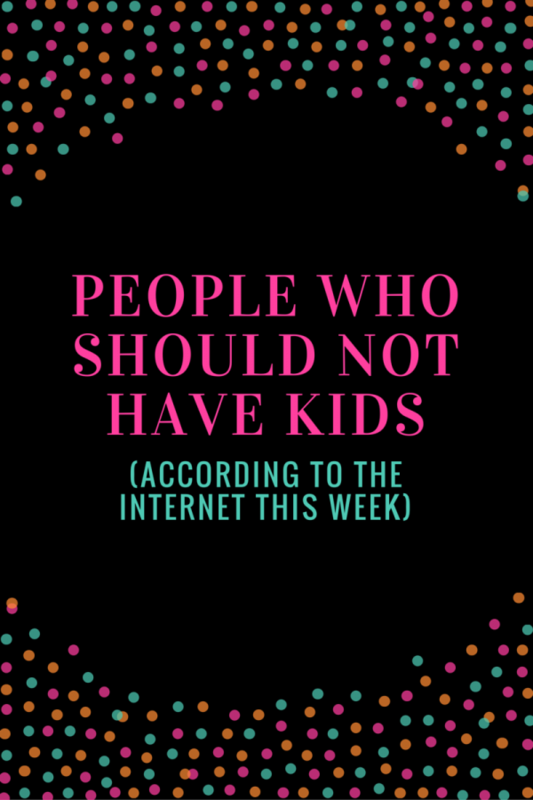 I figured you might be busy today, so I scrolled through some of the things commenters have said in various comment threads on articles about parents in the news over the past week or so and made what seems to be a fairly thorough list of people who should not have kids. Again: this is information I normally would not know without the delightful help of strangers on the internet. Hooray for information! If you really take the time to look it over, it seems pretty reasonable for those of us who want to plan ahead and be the best parents possible, dontcha think? Quite frankly, I wish I had this handy-dandy resource back before I started reproducing so I wouldn’t have wasted my time with this whole motherhood thing. People who ever have been or ever might be distracted. People who close their eyes when they sneeze. People without the reflexes of a ninja. People who have ever confessed to feeling like they’re having a hard time with anything at all. People who like spelling traditional names in non-traditional ways. People who do not have enough limbs and/or strength in order to carry and be in physical contact with all of their children at the same time always. People with any physical or mental limitation (i.e. migraines, bones that could break, loss of limb during fighting for our nation’s freedom, being a victim in a car wreck that paralyzed your legs, feelings of exhaustion/sleep deprivation, etc.) that makes them incapable of always being right next to their child every second of the day no matter how quickly the child can move or maneuver . People who like to sleep in their bedroom without their kids within reach. People who like to sleep in their bedroom with their kids too closely within reach. People who cannot hold in their feces, urine and/or menses and require potentially using bathrooms that cannot fit all of their children in the stall (thus out of visual range) with them. People who use public bathrooms who might have children who either are the opposite gender as them or could appear to be due to genetics or style preference. People who have regular phones and have ever yelled before. People who like to take photographs of their family on adventures. People who need to hug loved ones they haven’t seen in a while, which requires potentially turning their back on the children they are supposed to be watching. People who have ever liked an animal more than a human. People who have ever liked a human more than an animal. People whose instincts have ever been wrong. People who don’t care about getting back to their pre-pregnancy weight. People who do not have x-ray vision in order to see through people who might accidentally or deliberately stand between them and their children. People who were curious when they were children therefore might breed curious children, themselves, which can only lead to danger. People who need to look at items in stores when they are shopping, even if they can’t find a babysitter for the kids who then have to come with them to the store. People who ever have or ever might have the need to ask for some financial assistance. People who need communication devices in order to speak with their partner about their children (telepaths are totally okay, as long as they don’t need to close their eyes and put one hand to their head to focus on sending the message—those are absolutely unacceptable). People who are different than other people in any way. People who ever have or ever will turn their backs for a moment for reasons such as locating an itch that needs scratching or dodging an oncoming car running a red light straight at them. People who have ever made a single mistake, misjudgement, miscalculation or misunderstanding in the entirety of their lives or possibly could in the future. There is a slight chance I am being cranky right now due to the amount of people lining up to throw stones at those of us who are trying our best. I think Brenna of Suburban Snapshots said it best when she said, “We trade empathy for torches and pitchforks because those tools are easier to carry.” This sentiment applies to so much toxicity I’ve been seeing lately. Can’t we all just be a village again? Can we please accept that no one is perfect and be just a little tiny bit kinder to one another? Seriously? Are they still alive after a rude comment like that?